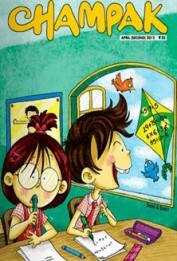 Champak (English) Fortnightly is one of the oldest children stories magazine. Since its inception champak has adhered to inculcating moral values in the growing children. Champak is a name children swear by. Published in 8 languages, Champak is a bouquet of short stories, comic strips, puzzles, brain teasers and jokes that sets the child's imagination free. It is the largest read children's magazine in the country. Yet not received Champak books from your side. Sir, I am very sorry to say you that your service is not very good. I am not received my online ordered book till now. My Order No. : 30450 Order Date: 04 April 2017, 1:19 PM. Please check and send my books. I had placed an order on January 3 for a one year subscription of Champak (English). The order was well received and the subscription was to start from March end. From March end until today I have done numerous follow-ups with the team but I failed to get a proper response. Somehow my order was cancelled since they had issues with the publishing house. I was told in the month of May that the amount will be refunded. Its August 1 today, and I am still following up for the refund. Tried calling their helpline number numerous times, but each time my calls went unanswered. Totally unprofessional approach. I would not recommend anybody for any subscription from Bookstok. Placed order for Champak English and bookstok after being paid for it on Nov 2018, is yet to deliver the first copy. Emails are not replied with and phone calls are replied with contempt. Everytime a new timeline is thrown at me. Even after waiting for 7 weeks there are no signs of the magazine, when asked they say that they will refer and revert, but never keep their promise. Very unprofessional. Placed order for Champak English and after being paid for it on Nov 2018, bookstok is yet to deliver the first copy. Emails are either not replied or those replied contains no information other than empty promises. Phone calls are replied with contempt, new timelines are being thrown at me. Even after waiting for 7 weeks there is no signs of the magazine, when asked they say they will refer and revert, but never keep their promise. Very unprofessional.